25 miles before breakfast! Am I mad? A change of pace and blog type today. Instead of typing, here’s me waffling on this morning’s pedal. But not my road bike, I came in this morning via Bristol Road and 5 Ways. None of the advertised rain showed up which was nice. Did the pedal in a fairly brisk time too. Still pitch black though. Yesterday was a very mix and match pedal home. Due to the canal being closed in 2 places I came off the cut at 5 Ways and went via Birmingham University, around the new Selly Oak By-Pass by the new QE Hospital and eventually came through Shenley Fields and the hard way over Frankley Beeches. It was good seeing some roads I haven’t seen for a while. The pull up the Beeches is tiring while you’re doing it, but didn’t have any negative effects on me at all and I got in feeling pretty good. Excercises nailed when I dived in the house, then relax. I’m working from home for the rest of the week from tomorrow, so it’ll be up for a pre work pedal both days. I already have a germ of an idea for a route tomorrow morning. Should be around the 20 mile mark over roads I haven’t seen since I used to pedal to Land Rover at Solihull back in the late 90s. A very crappy day yesterday. I had to pedal home at 0900hrs because of a drama. All sorted. ‘Nuff said there. Very crappy though. The pedal in this morning was interupted by yet another towpath closure. It’s now no longer worth using the canal because of the 2 closures. So I had to pedal in on the road. Yet more crappiness, and the hits they keep on coming. Well, that’s what I thought I had this morning. After a week of seeing the dawn rise and pedalling in daylight, riding in the dark after the clocks went forward an hour yesterday was a shock. It won’t be for long though. Added on to the dark was a nasty fog along the canal, just as well it was dark, I couldn’t see the fog properly! My ride was its usual solitary trip with no-one to bug me or try to end my 47 years on the planet. Which was nice. Just thought I’d finish off with a picture of what I imagine is a typical “modern” cyclist’s desk with all of the gadgets plugged in. Last week I mentioned that the towpath was closed on my commute home due to building work. Well, here’s the route of the diversion that gets me from the canal at 5 Ways back on to the canal by Birmingham University. Watch out for the bloke on the Electric Bike about 4:35 in then near the end. 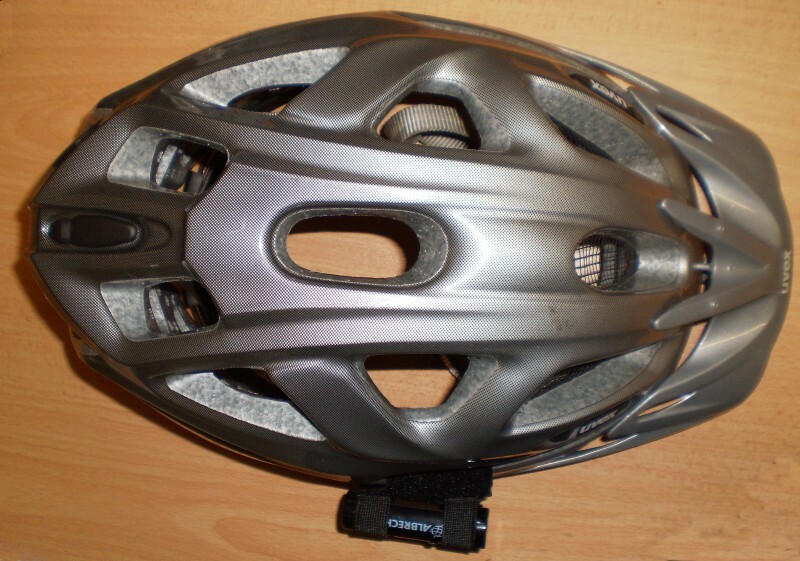 As I’ve mentioned in a past few posts my Muvi Helmet Cam died a while ago, I had it repaired by the Geeks at works but it completely died not long afterwards. 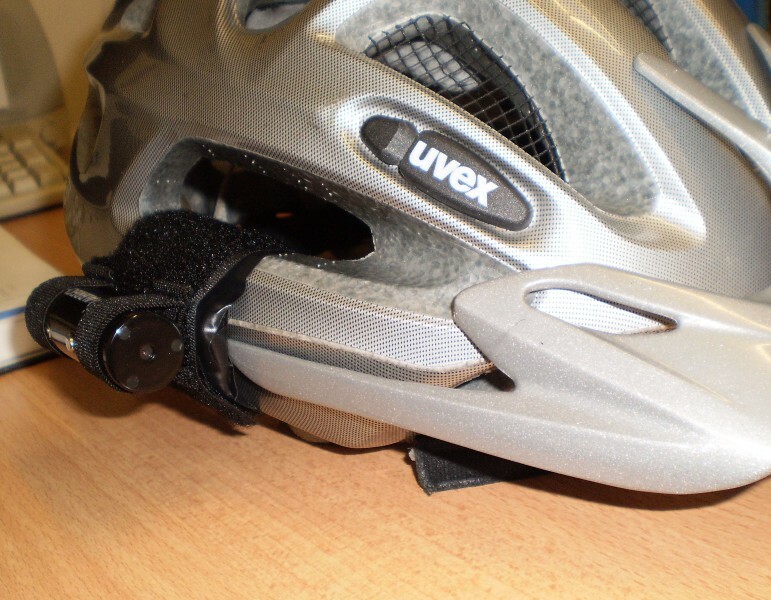 I brought a Muvi Clone for a tenner that didn’t last long either so I’ve been helmet cam less for a weeks now. 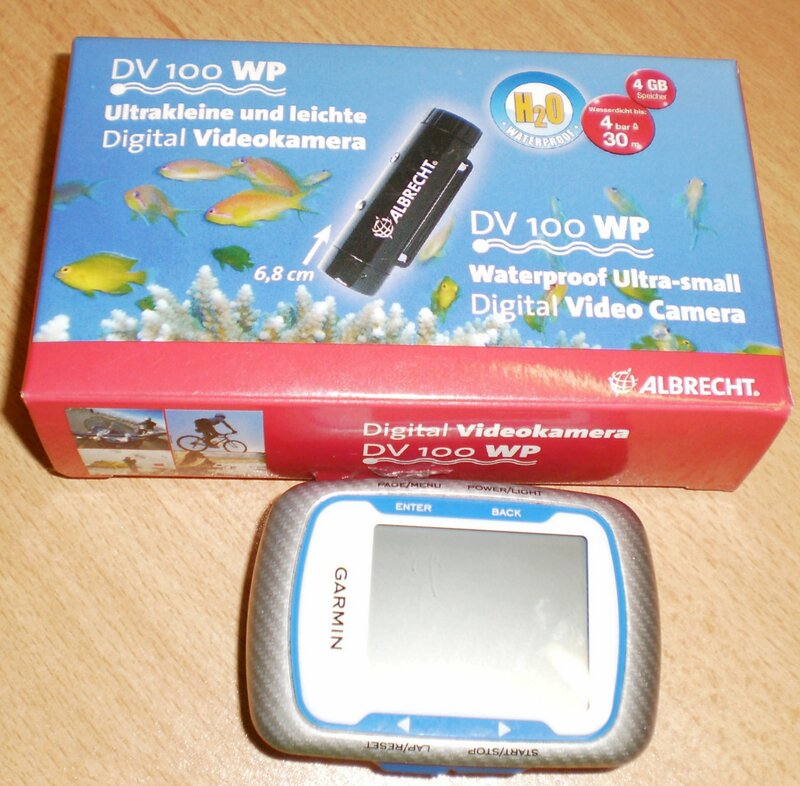 About a 3 weeks ago I bought this from Amazon a Albrecht DV 100 helmet Cam. 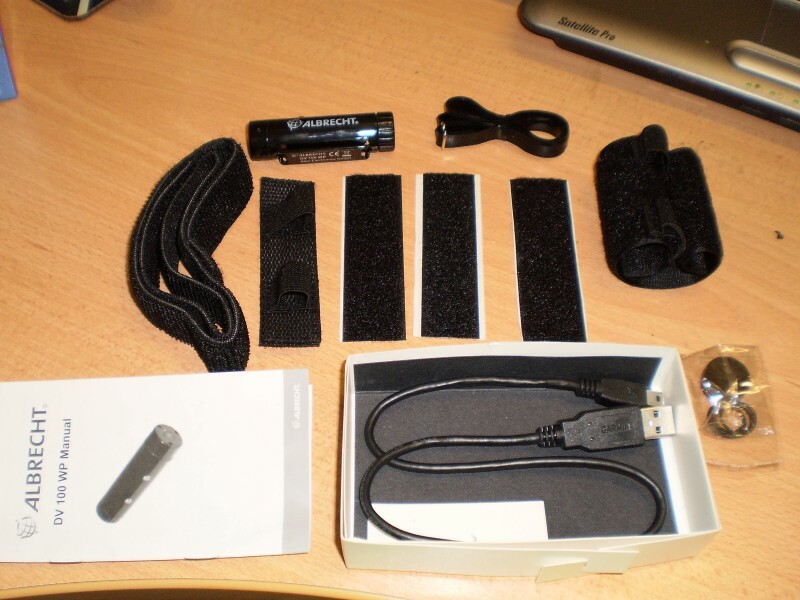 I’ve been using it for 3 weeks so I could assess its usability before posting this review. It arrives packaged like this. I’ve put my Garmin next to it for a size indicator. 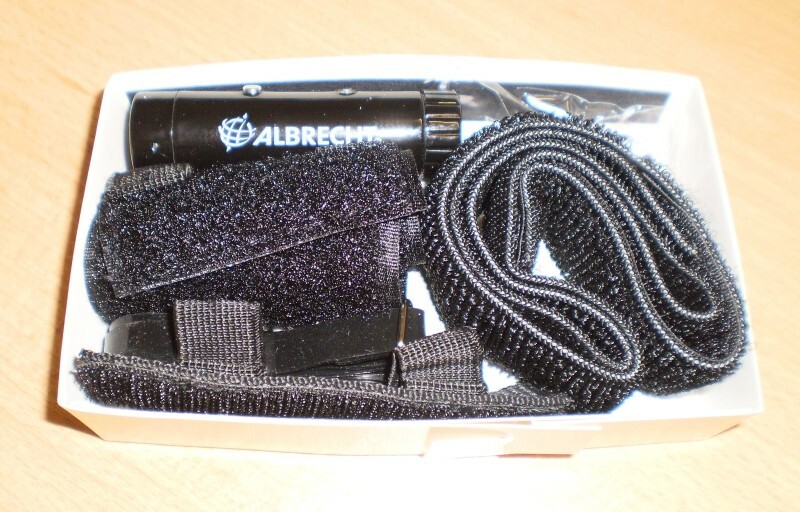 Which contains various strapping, O rings (more on them later), velcro attachments, USB cable, camera and manual. Here’s the kit out of the box. 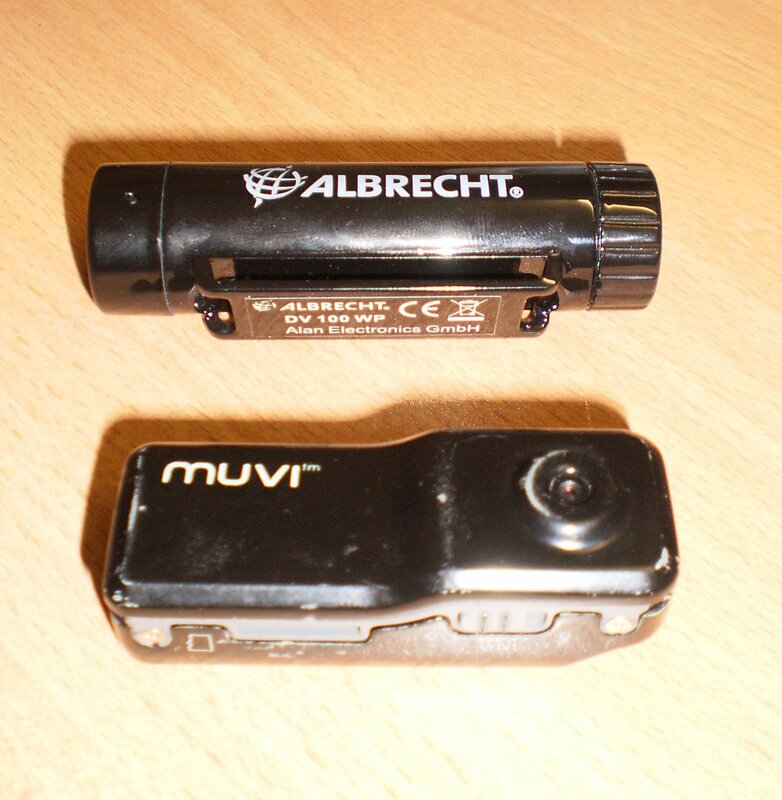 Here’s the camera with a Muvi for comparison. It is small! 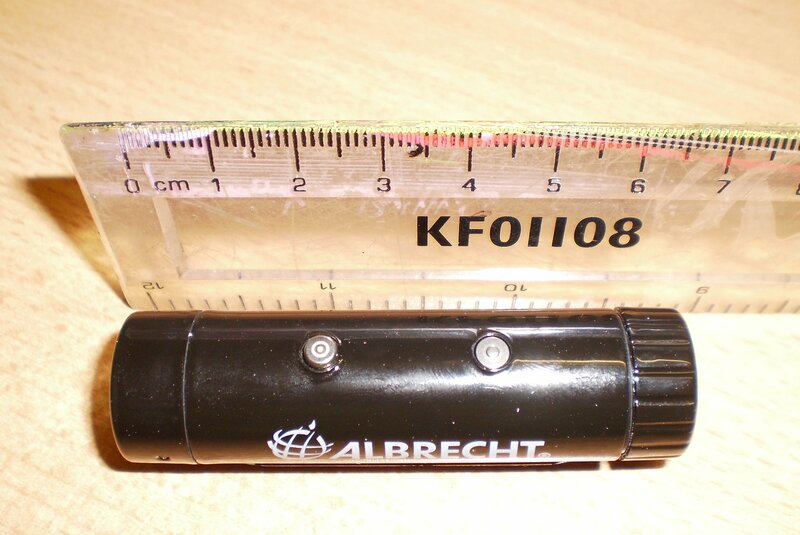 Here’s the beast with a ruler for actual measurement. That’s the kit, let’s get all nitty gritty with it. 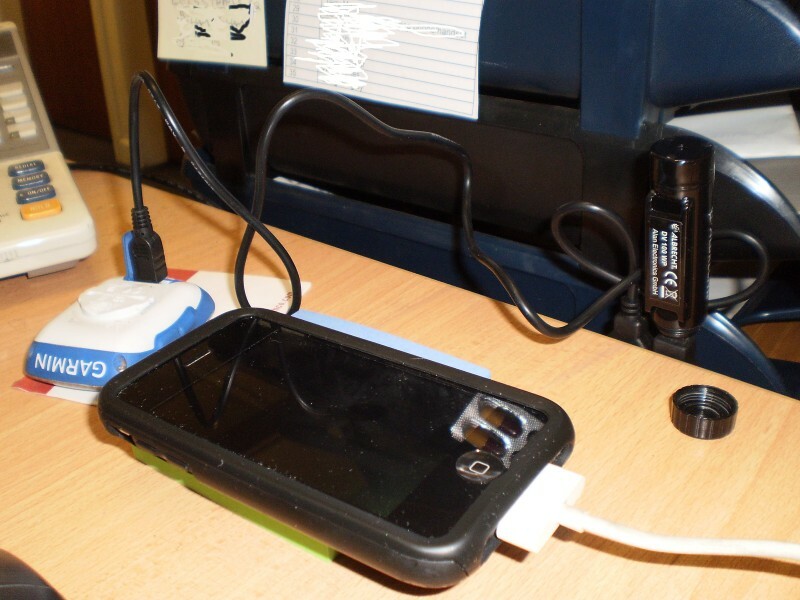 Basically this is how you use it, you plug the thing in via a standard USB cable to charge it. Your PC recognises it at the same time and delivers a VIDEO folder in your My Computer folder. Usual drill really. Go into the VIDEO folder and you’ll need to create a text file in there. This is for setting the time date settings. It needs to be set in this format. If the present time here is 0830hrs exactly on the 26th of March 2011, which coincidentally it is, then you’ll need to format the time date text like this: 20110326083000 save the file in the video folder and job done. Problem number 1. No matter how many times I did this it would never set correctly on the footage. Usually the time wouldn’t be correct. But on occasions the date would be incorrect to. Not good. As you can see in the photos, there are 2 buttons. One button at the front is slightly proud of the camera body. This is on/off/record. The second button at the rear of the camera is flush with the body and it’s the reset button. which resets the camera back to factory settings. There is a small LED at the front at the top to indicate operation. To operate the camera press the on/off/record button for approx 1 second. The camera switches on the green/blue LED activates the camera will then take 3 – 4 seconds to initialise. After the initialisation, the green LED flashes once then the blue LED will come on and flash every second to indicate recording. To switch off press the on/off/record button for 2 – 3 seconds both green and blue LED switches off then the device is off. Problem number 2. Now I don’t know whether I have a faulty unit or I’m doing something wrong, but when I come to turn it on, sometimes it will turn on, which is fine, then the blue LED will stay solidly on and I can’t even turn the bloody thing off without pressing the reset button! That means factory settings, redating the text file, not that that matters anyway, but more importantly no filming! If it does this after I’ve turned it off successfully after a pedal where I’ve filmed and I come to download the footage, it basically means the film is lost. It is very frustrating. This occurs randomly, indicating that maybe I’ve a faulty unit. Dunno yet. Onto the fun stuff. Here’s the thing attached to my helmet. It has a rear mounted internal microphone, which is not that great. You can swap the rear end cap for a solid one without the mesh for the microphone if you’re using it in 10 meter deep water, hence the spare O rings I mentioned earlier. If you use the end cap with the mike mesh then it is just waterproof not IP rated. Heres some footage I took last week. Typically an assassination attempt by bus! Here is more dicing with death through Selly Oak. Conclusion, for £106 it ain’t worth it. Footage is just ok, sound is crap, and the operation is iffy at best. I’ve been using for 3 weeks now and I’m not impressed. Sorry Albrecht it’s not great. I wouldn’t buy one again. I was doing my mileage sums this morning after my pedal and it seems that during yesterday’s pedal I cleared 6,000 miles since I started this thing 17 months ago. 6,000 miles. Phew! Maybe laughably small mileage for some, but I don’t think that’s too bad for a middle aged fat bloke! This morning’s pedal was done on my MTB commuter but I took it off road on some trails to join up the quieter roads. The trails were a bit bumpy and I did the ballistic downhill off the top of the Lickey’s into Barnt Green. You really could tell the benefits of full suspension when you ride it on a rigid bike. It was by necessity slower and a damn sight more uncomfortable. Good for upskilling your techniques though! Beautiful morning again and it was a joy to be out pedalling. Got my excercises in on my return too. I’ve upped the reps, weights and times on the excecises now. That must mean I’m improving! A good week’s pedalling all told. I think I’ve earned my trip to the Dodford Inn this evening!